Goan Food Fiesta is an event that took place between 24-Feb-2006 and 04-Mar-2006 in Hyderabad. The Blue Flower sponsors an indulgent express holiday to Goa on any night of  your choosing from the 24th of February to the 4th of March. Feel the salty sea-breeze as you bask in Konkani and English Goan folk-songs and watch Goan dancers who have been flown in exclusively for this show, all the way from the island of good-times. The place is decked up like one of the fishing beaches, with nets and fishes and the live-band of-course. You can have your fill of any of the exotic delicacies you choose, whether Sopa De Coconelos, Virdo Bhaji Com Panir, Stew De Cabrito, Xak Xak De Charge, Pex Balcao, Pulav De Graow, Pulav De Cabrito or Goan Red Rice. Believe us, each of these dishes actually pack as much ammunition as they sound. For desserts, you have Bebinca and Dodol, which are anything but your plain vanilla confections. 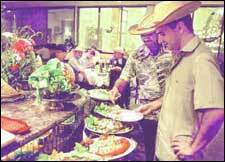 The dinner buffet is on from 1900 hrs to 2200 hrs every night and comes in two packages. With unlimited tipple (Kingfisher beer), you pay Rs. 600+ taxes. And if aren't for guzzling the slosh tonight, you pay only Rs. 550 + taxes. For further details, please contact  2339-3939, 5566-3939.
fullhyd.com has 700,000+ monthly visits. Tell Hyderabad what you feel about Goan Food Fiesta!